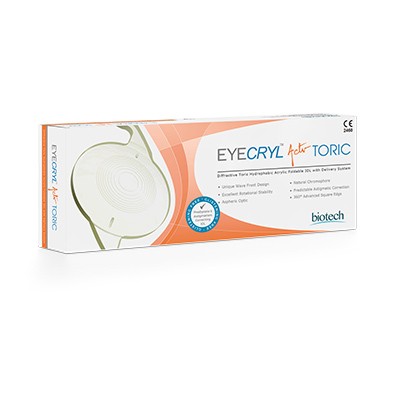 EYECRYL ACTV TORIC are Aspheric Toric IOLs with diffractive zones on optic, which are designed to give excellent surgical outcome with predictability and visual performance on consistent basis. The Eyecryl Actv Toric IOLs are intended to be implanted in capsular bag of eye as replacement of cataractous natural crystalline lens for visual correction of aphakia and pre-existing corneal astigmatism in adult patient with or without presbyopia, who desire improved uncorrected distance, intermediate and near vision, reduction of residual refractive cylinder and increased spectacle independency. User friendly & accurate Online Calculator provides Eyecryl Actv Toric model recommendation, Cylindrical Power & intended axis of IOL placement in the Capsular Bag.